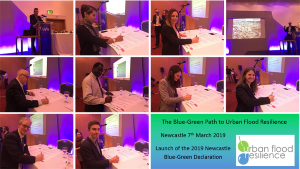 The RTPI has signed the Newcastle Declaration on Blue and Green Infrastructure, recognising the critical need for proactive investment in natural solutions which can address the challenges of flood risk and climate change, a concept linked to the IHBC’s 2019 School in Nottingham in July: ‘Heritage, Risk and Resilience’. Originally launched in 2016, the declaration also champions the multiple benefits that blue and green infrastructure has for the economy, environment and quality of life. The RTPI is already delivering on many of these commitments. Over the past year, the Institute has worked with the Chartered Institution of Water and Environmental Management (CIWEM) to provide recommendations for increasing the uptake of sustainable drainage systems (SuDS), with the Landscape Institute to examine barriers to the delivery of SuDS, and with Birmingham University to develop a tool for assessing changes in natural capital during planning. During 2019, the Institute will publish new research on the opportunities and barriers to integrated infrastructure planning in England and Scotland, and support advice from CIRIA on integrated water management. The Institute is also a member of the Green Infrastructure Partnership, and the RTPI partnered with the TCPA in 2018 to produce a guide for local authorities on planning for climate change. Our annual training programme includes masterclasses on planning for the environment, supported by new online modules on planning for trees and ancient woodland. Other signatories to the declaration include Arup, Stantec, Newcastle City Council, Newcastle University and the Environment Agency.